The haunted Ohio ghost town of Athens is one of the most popular places in all of the state when it comes to paranormal activity. Tucked away in the beautiful Appalachian Mountains, this little community is said to be one of the areas that sports many spirits and haunted folklore. Discovered to be a paranormal hot spot towards the end of the 1800’s, several investigators, spiritualists, and even those that are interested in the spiritual side of the occult travel to this community in order to discover the secrets of life through death. Now, you too, can take a tour through the lovely, yet haunted Ohio ghost town of Athens! 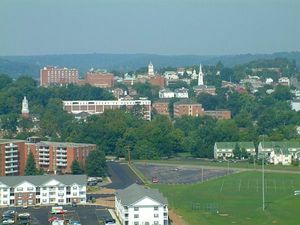 On the 23rd day of October in the year of 2000, the popular television network called “Fox Family” claimed that Athens, Ohio was one of the top cities of ten in all of the United States when it came to hauntings. The show that this was revealed on was called “World’s Scariest Places”. Since the debut of this television show, thousands have come into the community to explore the shadows, unexplained events, and to catch a glimpse of the several spirits that are said to roam within the boundaries of the ever-popular city. Today, several individuals seek to learn about the ghostly secrets of this haunted Ohio ghost town. One of the most notable places in all of Athens when it comes to spiritual encounters occurs at the popular Ohio University that is located within the city. This school was founded and opened in the year of 1804. A rich history of education, legends, and unusual events has occurred in and around this educational facility. As you walk through the halls, you can feel the immense energy that is held within them. There are many accounts and documented cases of strange and unusual phenomenon that occurs at the university. Students, faculty, staff, and even visitors have all attested to the fact that the structure is haunted. Jefferson Hall on the campus has had several tales of ghostly encounters and seemingly paranormal events that could not be explained. It is believed that a female who once cared for the hall still sits in the room that she was assigned to reside in while performing within the capacity of her job. Several students who looked to explore the dorm in which they resided stumbled upon an open door and saw her in a dark corner, working at a desk. As they attempted to talk, they realized she was floating, transparent, and not at all living. Later, they found the room to be locked and unused. In addition to this, sounds can be heard like items dropping on the floor when there is nothing to account for it. Voices are often heard as well – as if they are the echoes of the hall’s past. At one point in the history of the school, an entire girl’s basketball team had a tragic accident in the bus that was returning them to the school after a summer outing. This team is believed to haunt the area of Washington Hall as several students have heard the girls as if they are still alive – yet, no one is present. It is not uncommon to hear a basketball dribbling, laughter, or even a conversation when you are completely alone in the area. These are just a few of the examples of hauntings that occur in the campus of Ohio University in the haunted Ohio ghost town of Athens. The Athens Lunatic Asylum is also known as “The Ridges”. This hospital served the community patients from the year of 1874 to the year of 1993. There were a number of services offered to individuals who required them. Children to adults with mental illnesses, disabilities, and other devastations of the mind were serviced at the facility. Unfortunately, several medical practices that are typically considered to be inhumane, such as the infamous “lobotomy”, were performed at the facility. Patients were often deemed insane due to the fact that they masturbated, were having menstrual complications, experiencing the “change of life”, or being diagnosed with epilepsy. Over the years of operation, this facility had to create three individual cemeteries to house the individuals who died while being treated at the facility. At last count, it is believed that approximately two thousand people are buried in these cemeteries on the grounds of the insane asylum. Several accounts of unusual activities and apparitions have been said to occur in the structure, as well as on the grounds of the facility – particularly near the cemeteries. There is one haunting that is believed to be a lady by the name of “Margaret”. It is said that she wandered off one day and was not found until several weeks later when she was found in an abandoned room, dead. The cause of her wandering, where she had been, and how she ended up there – unnoticed – is still a mystery. In addition to this, to this day, there is an etching of her body in the floor near the bay window where she was discovered. This etching was not discovered until after the body had been removed from the area, and an employee revisited the location. There are several cemeteries in the haunted Ohio ghost town of Athens. There have been strange stories of the occult surrounding this particular town for ages. Five of the cemeteries in the area, if drawn out on a map, strangely transform into a point of a pentagram. The pentagram typically represents a magical type of protection for those that are in the occult, but also can be used in the commissions of curses. Could the strange outline created by the pentagram be used to protect the spirits that seem to roam the city, or was it designed by the occult in an effort to curse the small community? No one really knows the answer to this particular question, but it is one that could unravel many mysteries surrounding the spiritual ghost town. Naturally, all of these cemeteries are believed to be haunted. Simms Cemetery is located near the edge of a cliff where several individuals were hung. It is believed that the spirits of those hung, as well as John Simms still linger among the living as spirits. In Hanning Cemetery, there is a reported spirit of a male in a long robe that appears to cause screams and other eerie sounds to occur. These are just a couple of accounts surrounding this haunted Ohio ghost town of Athens. There are several spots, homes, and various locations in Athens that are believed to be extremely haunted. The items mentioned here are just some of the more active locations. If you are seeking haunted areas to explore, why not take on an entire city? Visit the haunted Ohio ghost town of Athens and step into the realm of mystery and spirits! Check for directions, hotels, attractions, view photos, and read the reviews and traveler tips for the city of Athens, Ohio! If you have experienced paranormal events in Athens, Ohio, we would love to hear your story! Simply click on the “Ghost Stories” tab on the navigational menu to submit them!